We’re calling for Scottish organisations to break their ties with fossil fuel polluters. This page collects more in-depth resources about campaigns to divest in universities, local councils and more. You can find out about local councils and the investments of the local government pension scheme on our Divest Local Government pages. Additionally UNISON have published a report to accompany their own campaign for councils to divest which you can download here. Our partner organisation 350.org hold many general purpose resources for divestment campaigns. Visit their site to find posters, films, guidance on using the media, political tactics, and much more. The UK Parliament pension fund has significant investments in fossil fuels. 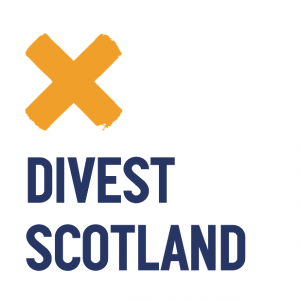 The Divest Parliament campaign has secured pledges from a number of MPs to divest. More than half of Scottish MPs have signed incuding all the MPs in Glasgow and Edinburgh. We’re also calling for MSPs to divest their own pension fund. You can read a briefing about this campaign here. There’s more about the fund’s investments from when we raised the issue in 2015 in this blog, when the issue was also covered by the Ferret and Common Space. 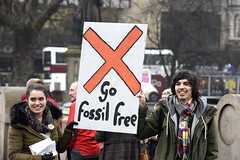 A number of faith groups in Scotland are campaigning for fossil fuel divestment, including in the Church of Scotland, where the matter was debated hotly at their 2016 and 2018 General Assemblies. We co-produced a briefing for Church of Scotland members which you can read here. Students have been campaigning for Fossil Free universities since 2013 with the University of Glasgow the first university in Europe to pledge divestment. This campaign continues to be driven by student network People & Planet, who publish a league table that exposes university’s fossil fuel investments. Journalist Rob Edwards has also exposed Scottish universities investments in fossil fuels. A number of campaigns have questioned the role of fossil fuels in sponsoring the arts and major events in Scotland. The Edinburgh International Science Festival has received funds from a number of mining and oil and gas companies. In 2015 arts group BP or not BP protested at the Edinburgh International Festival leading to BP being dropped as a sponsor that winter: a major victory. The campaign went on to put pressure on the Portrait Gallery’s hosting of the BP Award, and the Science Unstained group campaigns for a fossil free Edinburgh Science Festival. Looking for more information about the investments of a public organisation? Run a Freedom of Information request using www.whatdotheyknow.com. Divest Fracking – How UK councils are banking on dirty gas. Highlights from our campaign work protecting Scotland's environment in 2018.